“[p.11] I think I may fairly make two postulata. 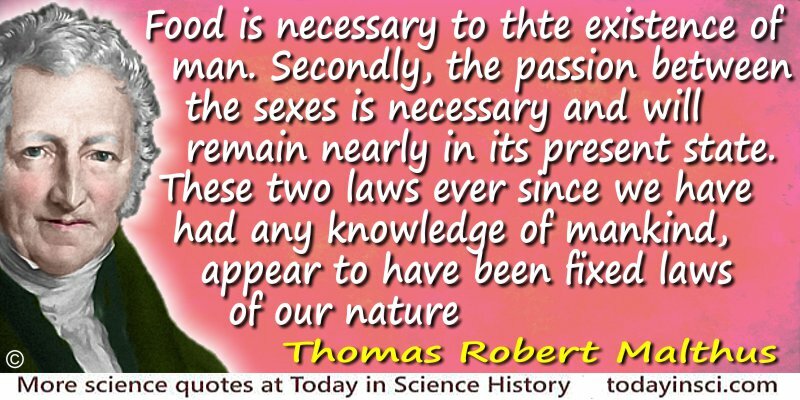 These two laws ever since we have had any knowledge of mankind, appear to have been fixed laws of our nature; and, as we have not hitherto seen any alteration in them, we have no right [p.12] to conclude that they will ever cease to be what they now are, without an immediate act of power in that Being who first arranged the system of the universe; and for the advantage of his creatures, still executes, according to fixed laws, all its various operations. I do not know that any writer has supposed that on this earth man will ultimately be able to live without food. But Mr Godwin has conjectured that the passion between the sexes may in time be extinguished. As, however, he calls this part of his work, a deviation into the land of conjecture, I will not dwell longer upon it at present, than to say, that the best arguments for the perfectibility of man, are drawn from a contemplation of the great progress that he has already made from the savage state, and the difficulty of saying where [p.13] he is to stop. But towards the extinction of the passion between the sexes, no progress whatever has hitherto been made. It appears to exist in as much force at present as it did two thousand or four thousand years ago. There are individual exceptions now as there always have been. But, as these exceptions do not appear to increase in number, it would surely be a very unphilosophical mode of arguing, to infer merely from the existence of an exception, that the exception would, in time, become the rule, and the rule the exception.